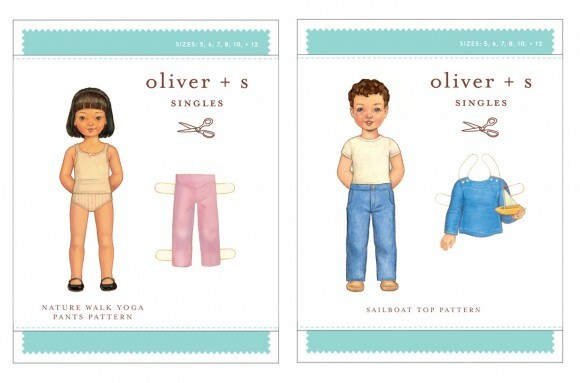 Many of you have been excited about the new(ish) Oliver + S Singles program. If you’re not familiar with it, we are releasing a number of easy-to-sew, single-item, digital-only patterns at a great price. These are the items that can be turned into the go-to basics of any kid’s wardrobe: t-shirt, leggings, skirt, jacket, etc. Welcome the Nature Walk Yoga Pants and the Sailboat Top to the mix. These two new items join the six others already in the collection to provide a number of items that you can mix and match, customize and alter, to create a foundational wardrobe for any season. Interested in how versatile the Nature Walk Yoga Pants can be? Check out this blog post showing how the same pattern has been used to make a pair of athletic pants, a pair for everyday casual wear, and pajama bottoms. We hope you enjoy working with these styles and that you turn them into staples in your sewing. Are there other items from our backlist that you would like to see made into Singles? Ack! From the picture above it looks as if you also enlarged the Sailboat top into size 12 (which would be oh so very welcome!) – but on the website size 8 is the largest available. Which one is right? Evan just told me this morning that she wanted to make some fleece pants/sweatpants.mi had no idea this yoga pant already existed. Thanks for singles! I’d like to see a pattern for unisex boxer shorts. The pockets packet is a great idea! I’d love the Sailboat Top in 34″ size for myself please. The facing looks neat, dressier and easier to achieve then the usual knit-top necklines (for a beginner anyway). Would also love the Sailboat top sized for adults. The Nature Walk pants are one of my favorites! Such an easy, versatile pattern. I’ve made them in cotton fleece with ribbed cuffs, cotton/lycra knit, stretch corduroy, and metallic stretch denim! They’re a great alternative to knit leggings for kids who like soft, stretchy clothes. Oh, yes. If the Sailboat is a 12 that would be wonderful! Love that you are releasing all these singles, thank you! I already own the puppet show pattern but I’m sure it would be very popular as a single as well. One that I’ve been looking at lately is the Badminton skort and the Class Picnic shorts. Any chance more singles are coming? 😉 Thanks!